Do you run and administer applications on Google Cloud Platform (GCP)? 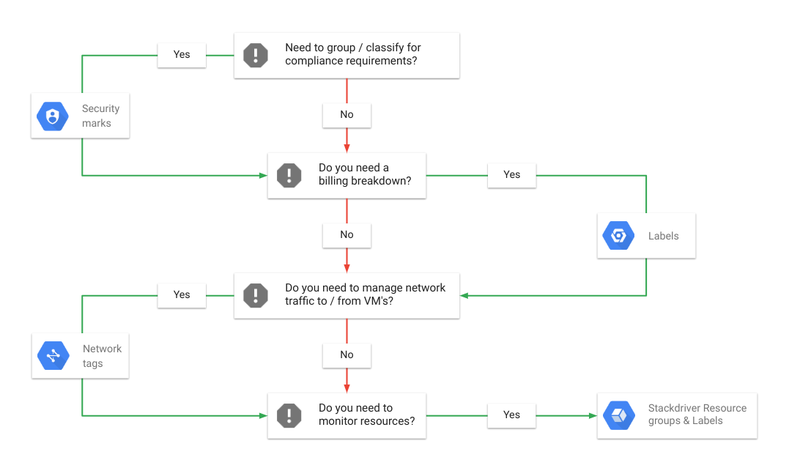 Do you need to group or classify your GCP resources to satisfy compliance demands? Do you need to manage traffic going to and from a VM, monitor specific resources, or see those resources by billing account? If you answered yes to any of these questions, you’ll be glad to know that GCP provides multiple ways to annotate your resources, to make them easier to track: security marks, labels and network tags. While each annotation has different functionality and scope, they are not mutually exclusive and you will often use a combination of them to meet your requirements. To help you choose which annotation, when, take a look at this flowchart. Let’s take a deeper look at each of these types of annotations. Note that Cloud Labels and Tags for the associated supported resources also appear and are indexed by Cloud SCC, so that you can use automation logic to create/modify marks based on the values of existing resource labels and tags. Marks are key-value pairs that are supported by a number of resources. They provide a security-focused view of the supported resources and are only visible from Cloud SCC. Edit or view access to the inventory of resources in Cloud SCC and their associated marks requires the securityCenter.editor IAM role, independently of the roles and permissions on the underlying resource. You can set marks at the org level, project level or for individual resources that support marks. To work with marks you can use, cURL, REST API, the Cloud SCC python library or the Cloud SCC asset inventory page by selecting the resources you wish to apply a mark to, then adding the key-value pair items. While in Alpha, keys must have a minimum length of 1 character and a maximum length of 63 characters, and cannot be empty. In the Beta and GA releases keys will be extended to support up to 256 characters and value can then have a maximum of 4096 characters. Keys and values can contain only lowercase letters, numeric characters, underscores, and dashes. All characters must use UTF-8 encoding, and can include international characters. You can find an up-to-date list of resources that can be annotated using marks here. Labels are key-value pairs that are supported by a number of GCP resources. You can use labels to track your spend in exported billing data. You can also use labels to filter and group resources for other use cases, for example, to identify all those resources that are in a test environment, as opposed to those in production. Use for cost allocation and billing breakdowns. Keys must have a minimum length of 1 character and a maximum length of 63 characters, and cannot be empty. Values can be empty, and have a maximum length of 63 characters. The key portion of a label must be unique. However, you can use the same key with multiple resources. Keys must start with a lowercase letter or international character. Check the supported resources to learn how to apply labels and to what you can apply them. For instance, BigQuery lets you add labels to your datasets, tables, and views, while Cloud Storage allows you to add labels to buckets. You can add labels to projects but not to folders. The permissions you need to add labels to resources are determined on a product-by-product basis. For example, BigQuery requires the bigquery.datasets.update permission to modify labels on datasets. The owner of the dataset has this permission by default but you can also assign at the project level the predefined IAM roles bigquery.dataOwner and bigquery.admin, which include this permission. You can also add labels to tables and views; this action requires the bigquery.tables.update permission. Assigning the predefined IAM roles at project level bigquery.dataOwner, bigquery.dataEditor or bigquery.admin grants this permission. The owner of the dataset has full permissions over the tables and views that the dataset contains. An up-to-date list of GCP products that support labels can be found here. Then, drill down into each product’s documentation for more details. Note that you can label instances, but if you are annotating these to manage network traffic, you should use tags instead (see below). Network tags apply to instances and are the means for controlling network traffic to and from a VM instance. On GCP networks, tags identify which VM instances are subject to firewall rules and network routes. You can use the tags as source and destination values in firewall rules. For routes, tags are used to identify to which instances a certain route applies. Using tags means you can create additional isolation between subnetworks by selectively allowing only certain instances to communicate. If you arrange for all instances in a subnetwork to share the same tag, you can specify that tag in firewall rules to simulate a per-subnetwork firewall. For example if you have a subnet called ‘subnet-a’, you can tag all instances in subnet-a with the tag ‘my-subnet-a’, and use that tag in firewall rules as a source or destination. For routes, tags are used to identify which instances a certain route applies to. For example, you might create a route that applies to all VM instances that have been tagged with the string vpn. You can set routes using gcloud commands or the Console. The following gcloud command creates a route called my-route in a network called my-network that restricts the route to only apply to instances tagged ‘web-prod’ or ‘api-gate-prod’. Network tags can however be modified by anyone in your org who has the Compute InstanceAdmin role in the project the network was created in. You can create a custom role with more restricted permissions that disable the ability to set tags on instances by removing the compute.instances.setTag permission from the Compute InstanceAdmin role. Instead of using tags and custom roles to prevent developers from adjusting tags (and thus enabling a firewall rule on their instances), use service accounts; Unless they have access to the appropriate centrally managed service accounts they will be unable to modify the rule. Refer to service accounts vs tags to determine whether the restrictions when using service accounts for firewall rules are acceptable. Must start and end with either a number or a lowercase character. To recap, here’s a table that summarizes common use cases and their associated annotations. Labels currently support a wider range of resources than Security marks. The Cloud SCC view of your resources includes, as properties of the resource, the labels and tags you’ve applied; you can then further apply ACL’d security marks to control the organization and filtering of the super set of resources, tags and labels. Use these when you want the control of the groups to be at either an organization level or specifically not in the control of the resource owner. If you manage a big, complex environment, you know how hard it can be to keep track of all your GCP resources. We hope that security marks, labels and network tags can make that task a little bit easier. For more information on tracking resources in GCP, check out this how-to guide on creating and managing labels. And watch this space for more insider tips on managing GCP resources like a pro.